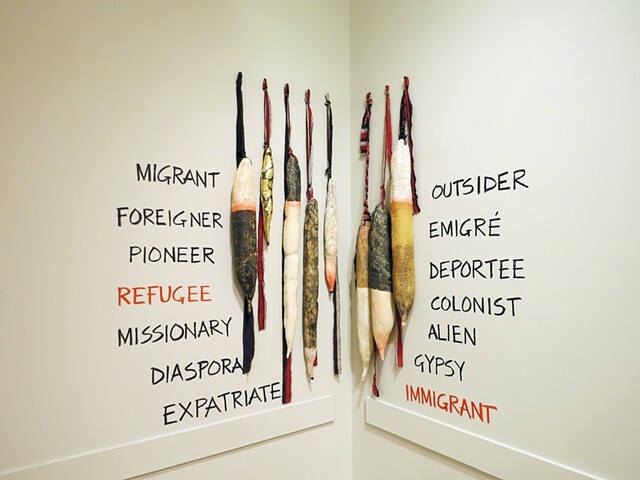 This work was spurred by an analytical interest in migration, of people as well as ideas and elements. Migration has been part of human activity since time immemorial and the very act of movement and displacement from its source of origin is also intrinsic to clay. When observing these abstract, mobile, textured forms please consider how its structure and composition is affected by environmental influences, both physical and chemical; the mineral composition of clay is unique to its journey of migration from the original source. No two clays are alike, and in transforming into ceramic sculpture it is further molded by human hand and concepts, tools of the craft as well as the energy from the kilns. Migration leaves an indelible mark on everything and everyone.